He's Vietnamese. She's From North Korea. They Had To Wait 3 Decades To Marry "I knew I should stop loving him," says Ri Yong Hui. "But I couldn't." She met Pham Ngoc Canh in 1971, when he was in North Korea on an internship. After years of separation, they married in 2002. 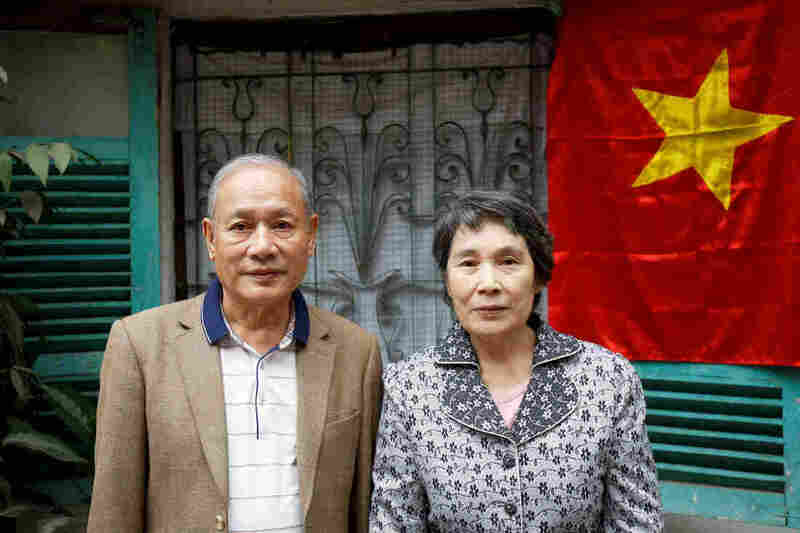 Pham Ngoc Canh, from Vietnam, met his North Korean wife, Ri Yong Hui, in 1971. They finally were able to marry in 2002 and now live in Hanoi. "It was love at first sight for me. I fell for him immediately," recalls Ri Yong Hui, 70, of her Vietnamese husband, 69-year-old Pham Ngoc Canh. The two are sitting on the sofa in their modest, Soviet-era apartment in Hanoi, speaking of the time back in the early 1970s when they first spotted each other working at a fertilizer plant in North Korea. "I was standing, working on the manufacturing line, and I saw her working in the lab," says her husband, who was on an internship at the plant. "And I said to myself, 'I'm going to make her my wife.' "
It was a bold statement, given North Korea's xenophobic reputation. He didn't much care. "I'm not afraid of anything," he says. "I took a handkerchief I'd bought in Beijing and a photo of me taken with two of my friends," he says. He sneaked into her lab when no one else was there and asked if she had a boyfriend. She said no. He then presented her with the gift and asked if he could visit her home. She said yes. "I had to take seven buses to get there," he remembers. "And then I had to walk about 3 kilometers [2 miles] from the last bus station to her house." "They didn't allow it, yes," says Ri, remembering. "But I wasn't strong enough to resist Canh. Because I knew I was in love with him. I knew I should stop loving him. But I couldn't." Several months later, when he had to return to Vietnam, they met again. Ri feared it might be the last time. "Kill me," Canh remembers Ri saying, desperate at the thought of living without him. "But I told her we loved each other. 'There's no reason to die,' I said. I told her I would try my best to find opportunities to come back to her as soon as possible." "I was glad to see you, but then we had to separate again," she says. "So, when Canh kept writing in his letters, 'Love knows no boundary,' it made me upset. And the idea that the end of every meeting was just another separation made me a little afraid of seeing him again." Sometimes, when relations between the two countries soured, or when they thought the security services were on to them, the letters stopped. So did the visits. Starting in the late 1980s, the couple had no direct communication for more than a decade. But there were other things on Ri's mind in those years. 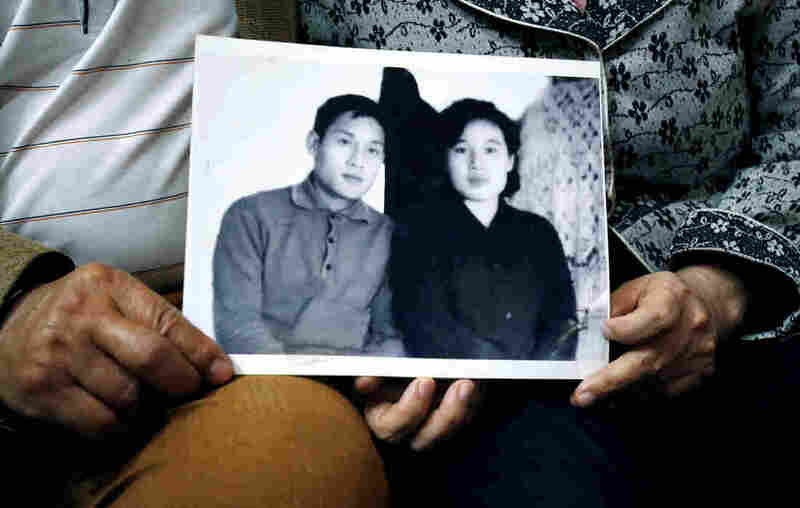 Canh and Ri hold a photo from their early days of courtship in 1971, when he was in North Korea on an internship. "My country back then," she remembers, "every day was a struggle, every day people were on the brink of starvation since the '90s, because of the Arduous March." That's the term North Koreans use to refer to the famine that gripped their country, taking hundreds of thousands and perhaps millions of lives, including her mother's. Back then, she says, "I opened my eyes every morning thinking, 'I did not die yet.' So I couldn't really think about Canh, because every day was like that." But in Hanoi, Canh was still scheming to reunite with her. As relations between the countries started to improve in the late 1980s, he started a personal charm offensive to, as he says, "build my personal credit with North Korea." He set up a Vietnam-North Korea friendship committee, raised money for a 7-ton donation of rice and reached out to North Korean contacts in Hanoi. In 2001, he made an audacious move, using connections in the Foreign Ministry to deliver a letter pleading his case to Vietnam's president — who was about to leave on a state visit to North Korea. "After I heard the president raised this issue, I thought, that's it," he says. "I've done all I can. But I knew in my heart that North Korea would say yes." "I don't regret anything," Ri says, laughing. "If I hadn't met him, if I hadn't come here, I would have been dead long before now." They don't have much money, she says — she wishes they did so she could help her country more. "I hope that there is some advancement in the coming summit," too, she says. "That U.S.-North Korean relationship gets better, and that the U.S. lifts sanctions and helps North Korea so that North Korea can develop." But she admits to being a little sad for her husband, "because he went through a lot waiting for me," she says. "And does not have any children because of that." Her husband just smiles. "No regrets," he says gently. "I still feel the same now as I did then." And, he says proudly, he was able to persuade a country with nuclear weapons to change its mind.